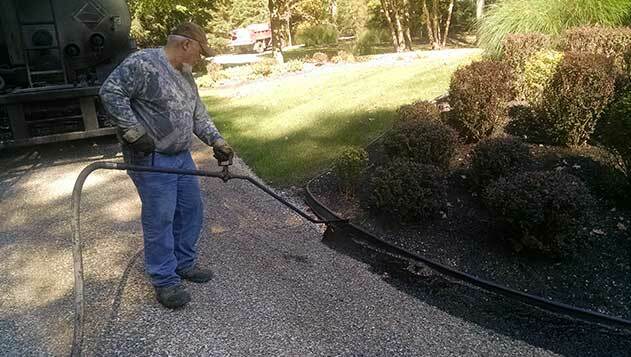 Do your driveway a favor and call (201) 327-5258 today for professional Ramsey driveway sealcoating services. Don’t just leave your driveway at the mercy of the elements. Give us a call and we will set up a free estimate and provide you with a sealcoating solution. Discover our current online sales and coupons when you click here now. One of the effective treatments that contractors use to keep your driveway looking great and functioning properly is sealcoating. It’s common knowledge that asphalt doesn’t last forever, and when your driveway starts showing the common signs of aging, sealcoating will help extend its life and give you an attractive driveway at the same time. Are you curious to know what others think of our range of services? Click here for online reviews. Driveway sealcoating refers to the application of a “seal” or barrier between your asphalt driveway and the elements that cause damage. It helps to keep harmful elements out and beneficial elements in. Sealcoat is a liquid that your pavement contractor applies with one of a few different pieces of equipment. Sealcoating won’t add to the structural integrity of your driveway, but it will protect the pavement, which is the whole point. When elements such as rain, snow, sun and wind take their toll on your driveway, the pavement becomes hard and brittle and breaks apart. The sealcoat provides a waterproof barrier to keep the water out and prevent this type of damage from occurring. Sealcoating also improves the friction of the asphalt surface, which isn’t quite as important on a driveway as it is on a roadway, but it is still a factor. Weather conditions have a profound effect on sealcoats, so it is important to have them applied on days when the weather is ideal. A good day for sealcoat application would be warm and sunny, with low humidity. When the weather is cooler and humid, the curing time of the sealcoat will be longer, which puts it at greater risk of damage. Sealcoating during a rainy day never makes sense, so make sure your paving contractor is aware of this and schedules the application when the forecast is clear. It’s important to keep in mind that sealcoating is a maintenance procedure that works well for driveways with minimal to moderate cracking and other damage. It won’t fix any serious damage, but it will prevent damage from happening and make your driveway last longer. Give your driveway the best treatment possible and see if sealcoating is the right thing to do. Call McFarlane Asphalt today at (201) 327-5258 in the Ramsey, NJ area and we will schedule a visit to find out if sealcoating is a good option for you.